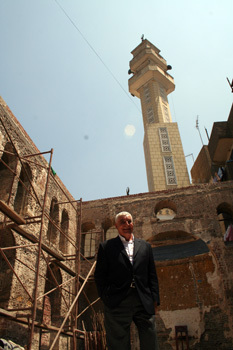 In view of the 1992 earthquake and the rising water table and damages resultant, one of JCC's priorities during the past decade has been the unrelentless call for the restoration of the historic Maimonides "Rav Moshe ben Maimoun" Synagogue in Cairo's Mouski-Gamaleya area at No.15 Darb Mahmoud. (see Bassatine News Issue 6 ). The calls and prayers were eventually heard by the concerned authorities and the fallen Synagogue was slotted for massive restoration works by the Supreme Council of Antiquities (SCA) once the surrounding rising water table problem issue was adequately dealt with. The water and sewage problem finally resolved, work on the Synagogue commenced a few months ago. Yet for some twisted reason this particular restoration unduly attracted the attention of the local and international media this summer (August-Spetember 2009). 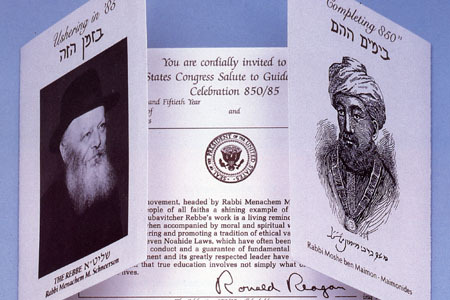 The coverage somehow linked the Maimonides restoration to the coming UNESCO elections. Clearly the interested parties had not read a related article which appeared a year ago in al-Ahram Hebdo (13 - 19 August 2008 issue) detailing the heretofore carefully laid out plans for the restoration of the said Synagogue among other Cairo Synagogues, plans that were in the offing before nominations to the UNESCO presidency had become a hot issue (see Bassatine News Issue 24 ). According to Zahi Hawas, current head of SCA, all monuments in Egypt are treated equally with no religious bias whether pharaonic, Roman, Hellenic, Byzantine, Shi'a Fatimid or Sunni Mamluk, Christian or Jewish. Yet in view of the abundance of such monuments in Egypt, each earmarked restoration must wait its turn within a larger master revival plan. It so happens that the turn of the Maimonides Synagogue came in 2009. The Synagogue, which is divided into three sections: prayer hall, yeshiva, and a women's prayer section, is named after Rabbi Moses Maimonides (b. 1135 in Umayad Cordoba in Andalousia, Spain - d. 1204 in Fostat, Cairo). A contemporary of Ibn Rushd (Averroes), Maimonides was a renown 13th century physician and scholar whose code of law "Mishneh Torah" written in Fostat in 1168, was considered of paramount value among the Jews and to this day is taught around the world. During his lengthy stay in Egypt Maimonides headed for some time the Jewish community of Cairo. Moreover, he was physician to Salah al-Din al-Ayoubi (sultan of Egypt and Syria a.k.a. Saladin) along with the senior members of his court including Saladin's son al-Afdal and his grand-vizier al-Fadil. Maimonides the philosopher and judge witnessed first hand Egypt's transformation from a Shi'ite-ruled sultanate under the Fatimids to a Sunni bastion ruled by the Ayubid clan with nominal allegiance to an Abbasid Caliph in Baghdad. One constant during this cataclysmic transformation were the Christian crusades against Syria, Palestine, Egypt and Constantinople. Another, was the continued existence of Jews across the Middle East, from Fes and Meknes in the Moorish principalities to Baghdad and Mosul in Mesopotamia. 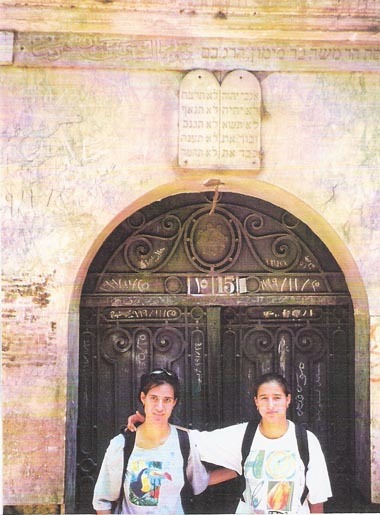 In the 19th and 20th centuries Jews and non-Jews alike believed Cairo's Maimonides Synagogue was blessed making it a place of pilgrimage and of alleged miraculous healings. (see account of David Hirsch in Bassatine News Issue 9). That same historic Synagogue was also the subject of considerable interest in the first half of the 20th century during an earlier restoration. 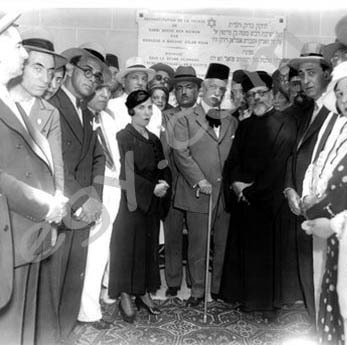 At the time the Jewish community in Cairo was headed by Youssef Cattaui Pasha and presided over by Grand Rabbi/Senator Haim Nahum (see B&W photo below) . Although two non-professional restorations took place later in the century with the help of donations, the elements followed by an earthquake brought the house down so to speak. 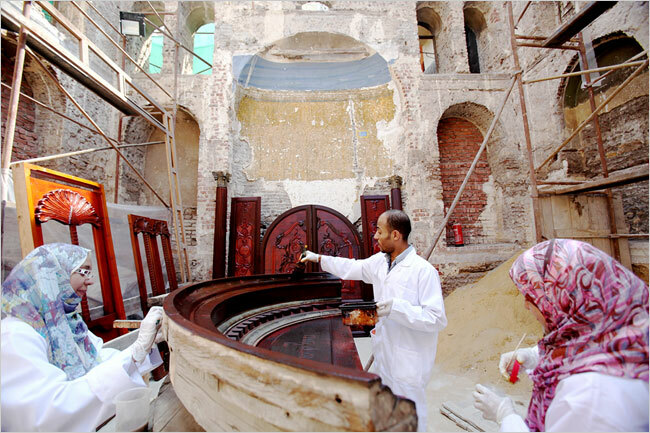 This latest restoration which attracted so much media attention but for the wrong reason is expected to be completed by 2010, according to Zahi Hawas, current head of SCA. 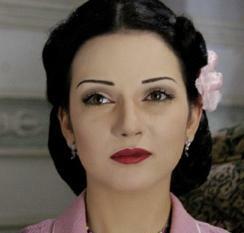 An arabic-language biographical series is being aired during Ramadan 2009 on several arabic local and satellite channels entitled "Ana Kalbi Dalili" (My heart is my Guide) telling the story of actress-singer Leila Mourad played out by Syrian actress Safaa Sultan. Togo Mizrahi is not only one of the founding fathers of Alexandrian cinema in the thirties, but he also contributed greatly to Egyptian cinema as a whole. Equally important is that the forceful presence and the total integration of Togo Mizrahi, an Italian Jew, into the Alexandrian scene attest to the tolerance and co-existence of the cosmopolitan Alexandria of his time, where diverse ethnic and religious groups lived in harmony. This cosmopolitan spirit seems to have infiltrated into Mizrahi�s consciousness for it was to figure in a number of his films, such as Seven o�clock and The Two Delegates. Mizrahi was born on 2 June 1901 to an Italian family that lived in Alexandria. After receiving his education in Alexandrian schools and earning a diploma in commerce, he left for Italy in 1921 to continue his studies. He then went to France but eventually came back to Alexandria in 1928 with a PhD in economics. On his return, he started his career in cinema by issuing a newsreel in Alexandria. He then founded The Egyptian Films Company and turned to feature films. 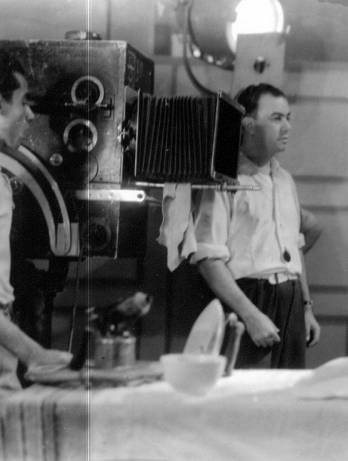 In his first film The Abyss (el H�wiyah) in 1930, Mizrahi proved to be a man of many talents for he produced, directed, edited, acted, designed the set and wrote the script. This film was made in Bacos Studio, a cinema theatre which Mizrahi had bought and converted into a studio with a plateau, the necessary equipments and actors� rooms. It was in this studio that he made all his Alexandrian films until he moved the premises of his company to Cairo in 1939. The film premiered in Alexandria and was next shown in Cairo on 2 February 1931, but under a new name, Cocaine (el koka�n). Togo chose to act under the pseudonym of Ahmed el Meshriqi, and his brother, who acted in this film, used the pseudonym Abdel Aziz el Meshriqi. Mizrahi, who was in the habit of discovering new actors, presented in this film Shalom, a Jewish actor, who became a famous comedian in Egyptian cinema. Shalom was to work with him in a number of films such as 5001(khamsat �laf wa w�hid)in 1932,Shalom the Dragoman (Shalom el tourgm�n) in 1935, Much Wealth is a Nuisance (el �Izz bahdalah) in 1937, and Shalom the Athlete (Shalom el riy�d�) in 1937. In the following year, Mizrahi directed his second feature film 5001(khamsat �laf wa w�hid)and in 1935, he directed his first sound film Children of Egypt (Awl�d Misr). After his first three films Cocaine (el koka�n), 5001 (khamsat �laf wa w�hid), and Sons of Egypt (Awl�d Misr), which basically tackled social issues, he was to shift to comedy. 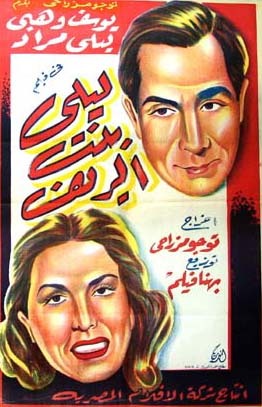 He started with The Two Delegates (el Mandoub�n) in 1934, a comic film starring the most famous duet of the Egyptian theatre at the time, Fawzi and Ehsane el Gazayerly . 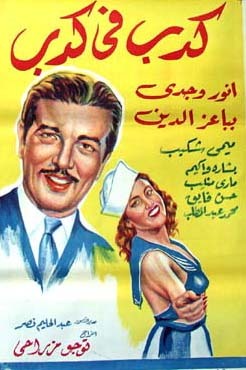 Mizrahi was to capitalize on the success of that film by teaming up with that successful duet in other films which he also acted in, Dr. Farahat (el Doktor Farh�t) in 1935 and The Sailor (el bahh�r)in 1935. After his successful experience with the Gazaerlis, he worked with Ali el Kassar, another famous comedian of the time. 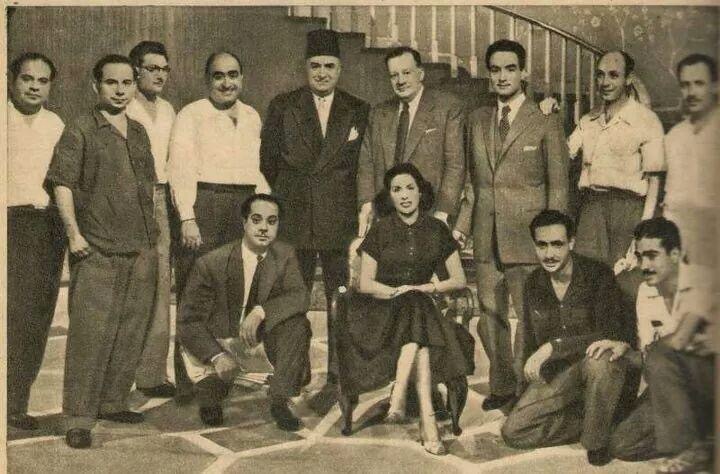 Together, they made nine successful films: One Hundred Thousand Pounds (Mit alf guinih) in 1936, The Guard of the Barracks (Khafir el darak) in 1936, Seven o'clock (el S�ah Sab�ah) in 1937, The Telegram (el Telegraf) in 1938, Osman and Ali (�Othman wa �Ali) in 1939, The Thousand and One Nights (Alf Lailah wa Lailah) in 1941, Ali Baba and the Forty Thieves (�Ali B�b� wa-l-arba'in har�mi) in 1942,and Nour Eddine and the Three Sailors (Nour Eddine wa-l-bahh�rah el thal�thah)in 1944. Interestingly enough, the last three movies were inspired by folktales and Arabic heritage. The spectators greatly enjoyed the hilarious stories of the unlucky Nubian, played by Ali el Kassar, not only because of his naivet� and the absurd situations he got into, but also because of his ethnic clothes and strong Nubian accent. One of Mizrahi�s most notable contributions to Egyptian cinema was that he turned Laila Mourad, the famous Egyptian singer and actress, into a legendary figure by presenting her in a new light. Together they made five films which he produced and directed: A Rainy Night (Laylah moumtirah) in 1939, Laila from the Countryside (Layla bint el rif) in 1941, Laila the School Girl (Layla bint el mad�ris) in 1941, Laila (1942), and Laila in the Dark (Layla fi-l-zal�m) in 1944. Mizrahi had another successful experience with Greek cinema for he produced and directed four Greek-speaking films which were a success in Greek cinema theatres. It was customary for Greek theatrical troupes to finish off their season with a grand tour to different countries where they would perform their plays before the Greek communities. 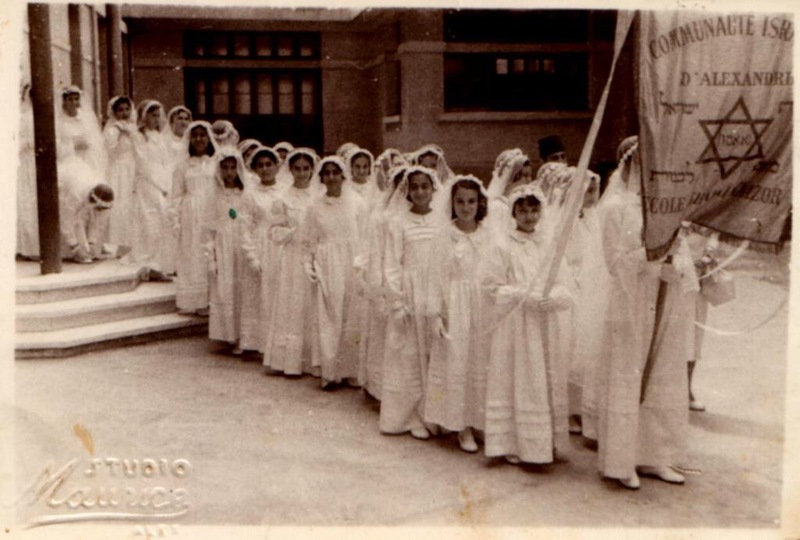 The largest and most important Greek community was the one in Egypt. That is why most of the Greek theatrical troupes presented their plays in Alexandria, Cairo, Port Said and Ismailia from the turn of the twentieth century till the fifties. When Mizrahi met the Kaltos Sisters Troupe in 1937, while they were performing in Egypt, he approached them with a translated script of a film he had already directed, Dr. Farahat, which he proposed to produce and direct for the troupe. The troupe immediately agreed to his proposal and the film was made and shown in Greece under the title of Doctor Epaminondas. 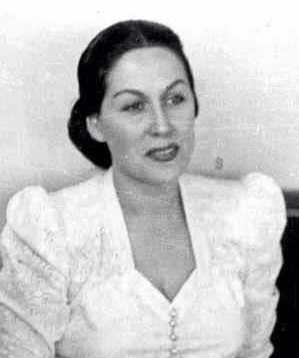 The success of the film seems to have triggered competition for in 1938, the owner of the largest Greek troupe, Sofia Fembo, approached Mizrahi with a script, which he was to direct and produce for her, and in the same year he was to direct and produce another Greek film for the Kaltos Sisters Troupe. Finally, in 1943, he directed and produced The Sailor for the Kaltos Sisters, a film which he had already directed in 1935. Another important film in Togo's career is Sallama (Sall�mah) in 1945, a historical film set in the Umayyad times, starring the most famous Egyptian singer Oum Kalthoum. Towards the end of his career, he produced films that were directed by young promising Egyptian directors: The Son of the Blacksmith (Ibn el hadd�d)in 1944, Divine Providence (Yadu Allah) in 1946 and The Great Artist (el Fann�n el 'az�m) in 1945 by Youssef Wahbi, Mohamed Ali Street (Sh�ri� Mouhammad �Ali) in 1944 and Beauty Queen (Malikat el gam�l) in 1946 by Niazi Mustafa, and Appearances el Maz�hir in 1945 and Love Train (Express el houbb) in 1946 by Hussein Fawzi. In 1939, with the outbreak of World War II, Mizrahi moved to a studio in Cairo, on 4, Hosni Street, Guiza, while retaining his old one in Bacos. Until the studios were sequestrated then liquidated in the 1960s, the letterhead of the The Egyptian Films Company continued to carry the two addresses: Studios Bacos and Studios Guiza. Mizrahi himself left Egypt for good in 1948, settling in Rome until his death in 1986. The studios went on functioning under the direction of his nephew Alfredo, who operated from Cairo, until the The Egyptian Films Company was liquidated in 1966. Thus ended the Mizrahi saga in Egypt. While he worked at a reduced rate in the cinema in Rome, due to health problems, Mizrahi continued to show a keen interest in what was happening in Egypt. He arranged for a subscription to the Egyptian cinema magazines El Messawar and El Kawakeb, although money and transfer arrangements had become complicated during the 1960s. Wanting a little bit of Egypt in Rome, he asked Georges Behna for some of his old posters and photographs with which to decorate his office, and though all material had had to be handed over to the liquidator of the Egyptian Films Company, Georges did manage to find some in his stores to send to his friend. Mizrahi also followed Omar Sharif�s rise to international stardom, and noted that he was now acting with Sophia Loren. His personal letterhead carried, in addition to his Rome address, his Egyptian one at Guiza, complete with telephone number. 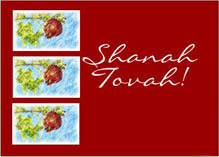 From "The Digest of the Egyptian Jewish Heritage Society No. 1389"
We were astonished by the request of some visitors of the Jewish Community in Alexandria to meet with Mr. Yves Fedida the representative of the Association International Nabi Daniel based in France .  As we asked them about the purpose of their request, we were informed of the existence of a web site belonging to the above mentioned association, within which information claimed that the Association International Nabi Daniel's address in Alexandria is El Nabi Daniel st, in Cairo is Sabil al- khazendar st, and in Europe is 22 Cours Ferdinand de Lesseps 92500 Rueil Malmaison, France . 1- The Egyptian Jewish Community in Alexandria has nothing to do with the Association International Nabi Daniel, France. 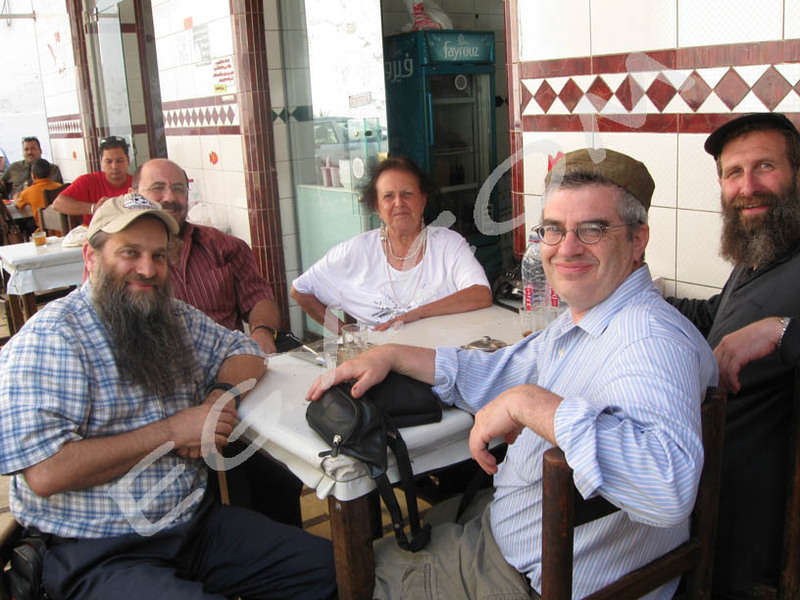 2- The members of the Association International Nabi Daniel, France usually come to the Jewish Community in Alexandria and are always accepted as visitors and guests as any other tourists. 3- The Jewish Community in Alexandria is an independent religious organization; it is not a part of any other association. 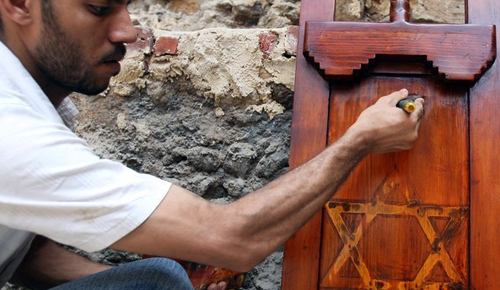 Hence, it is independent from the Jewish Community in Cairo . 4- According to all what has come above, we notify the Association International Nabi Daniel, France to immediately rectify the information posted on their web site in order to avoid any further misunderstanding.